In the UK, burglary rates of vans have risen by more than two thirds in the past two years, from 14,063 in 2014-2015 to 22,749 in 2016-2017. This equates to a van being broken into every 23 minutes on average. Trade vans are found to be particularly vulnerable and targeted for their contents of stock and expensive tools and equipment. With such temptation rife amongst commercial vehicles, maintaining van security is essential along with backup from flexible fleet insurance. LCV (Light Commercial Vehicle) ownership has also increased by 29 percent in the last 10 years. Trends such as the growth in demand for same-day or next-day delivery are contributing to the expected further rises in ownership in the future, along with greater concerns for security. Unfortunately, commercial vans are the target for many thieves which can amount to huge losses in revenue for many businesses. Not only is there the list price of the vehicle to consider as a loss but the value of materials, tools and lost revenue from potential lost business. The loss of a van and tools can affect your whole business and potentially lose you jobs and clients. Each type of van has their individual weak spots which will be well-known to criminals, so it is important that your drivers are aware of these and that they keep them in mind. There may be operational security issues, such as whether the cab is locked when you are getting things out of the back of the van and does the cargo door lock automatically when you shut it? 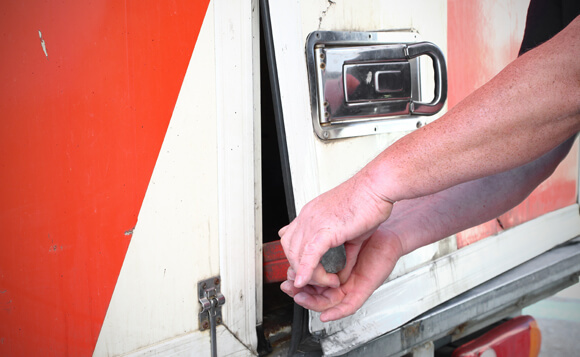 Many thefts and concerns on van security have been attributed to the use of commercially available transponder keys, or skeleton keys which can be easily bought legally online. However, by fitting additional security equipment to your commercial vans such as a slam lock or trackers the overall effectiveness of such devices can be limited. It is important to consider making it as difficult, noisy and time-consuming as possible for thieves to break into your commercial vans. A slam lock is a device which automatically locks the van door immediately as it is shut without any operation required. It’s ideal for multi-drop delivery vans carrying high value loads and should be considered along with courier van insurance. There are many security measures out there from cheaper to more expensive options. There are plenty of affordable measures such as heavy-duty steering locks and hand brake locks, or applying plastic window tints or stickers warning that tools are not left in vehicles overnight. In many cases such visible barriers act as a strong deterrent to thieves. In addition to this it is worth considering implementing caged areas into vans containing high-value goods, and for larger tools you should consider chains and locks to secure such items when not in use. Steel strengthening plates, loom guards, and window grilles are also available for added protection. On the higher end of the scale, and probably worth considering for larger fleets, GPS tracking systems will alert you to the location of a vehicle if it is stolen. Electronic GPS trackers will vastly improve the chances of recovering a stolen vehicle as well as lowering your insurance premiums. Advanced systems will use multiple systems to locate the vehicle and alert the police. Often by re-iterating a bit of common sense when it comes to the best van security, you can practice prevention rather than cure. Inform your drivers that their vehicles should always be parked in well-lit areas and close to occupied buildings. It’s important to always keep keys out of sight and if you can, to park your rear doors against a wall, garage door or another car. Where possible drivers should also remove valuables from the van, and be aware of keeping items on display such as sat-navs or smartphones which are often targets. Branding of your vehicles is also something that should be carefully considered. Whilst it is good advertising, some businesses can certainly find themselves being targeted depending on their industry or if they belong to specific well-known retail companies. By insuring your commercial vans appropriately, you will be protecting your investments and ensuring that you can get back on the road and out to work as soon as possible. Fleet van insurance is the best option for protecting your business assets and there are several security measures that you can adopt to help reduce your premiums. Many insurers will offer ‘tools in transit’ and 'goods in transit' cover which is important to ensure the contents of your vehicle is covered, but you need to be aware that this will not always include when belongings are left in an unattended vehicle overnight. It is advisable to contact your insurer to check which security devices they will recognise as helping to reduce your risk. Want to find out more about Bluedrop's Fleet Van Insurance?